EYEWITNESS IN MANCHESTER UPDATE 11pm BST THURSDAY 24 SEPT 1998 APOLOGIES FOR THE REDUCED FREQUENCY OF UPDATES THIS WEEK, BUT I HAVE BEEN OUT TAKING ADVANTAGE OF THE GOOD WEATHER TO BRING YOU LOTS MORE PHOTOS OF YOUR FAVOURITE CITY AND REGION. THE NEXT EWM UPDATE WILL FOLLOW ON SATURDAY EVENING. MANCHESTER ON COURSE FOR THE GAMES! - I've just returned from a big event in Albert Square to mark the end of the Commonwealth Games in Kuala Lumpur, and the handing over of the baton to Manchester. - In bright sunshine, watched by tv cameras, a crowd of mostly young people listened to Manchester bands, including Parrish, James and New Order. After a number of delays, compere Tony Wilson announced that we were going live via satellite to Malaysia, where, on a big screen, we saw Bobby Charlton and two young athletes join hands on stage to form the M for Manchester logo. With the words "Hello Manchester", the symbolic baton was handed over - That's it, the countdown is on! 2002 here we come! IT'S BEEN A BUSY WEEK in Manchester, as ever. The In The City festival dominated the first part of the week, while Rupert Murdoch's Manchester United take-over bid brought fans to a mass meeting on Wednesday. This weekend sees the Stitchcraft 98 show at GMEX, while up in Heaton Park, competitors took place in the Pepsi Max Maina 98 festival of extreme sports. TRAFFIC JAMS clogged up the roads around the Trafford Centre last weekend, just as many had predicted. They're going to changed the traffic management system around the centre in order to ease traffic flow. In the meantime, we'll have to wait years for a Metrolink line to the centre - a railway line which passes nearby is still used by freight trains - a passenger train service might be introduced if the two types of rail traffic can be co-ordinated. STOCKPORT, JEWEL OF THE RING - that's the slogan which will be used to promote Stockport shopping centre, which is fighting back against the threat to its business coming from the new retail Goliath further up the M60. The "ring" in the slogan, is the M60 ring - it used to be the M63. I like Stockport for shopping, though a friend says he's uncomfortable taking children there, due to "undesirable elements". I grew up in Stockport, and remember it before the shopping centre. AN ESTIMATED 700 Manchester United football fans attended a special meeting at the Bridgewater Hall on Wednesday - they're hoping to block the �3m takeover bid by Rupert Murdoch's Sky Television. There have been calls to boycot Murdoch newspapers, and even MUFC merchandise. Whether they'll succeed remains to be seen. There is only a limited number of days in which the take-over can be stopped. Some say the take-over was inevitable once the club was floated on the Stock Market - this happened 7 years ago. And today (Saturday) Ryan Gigg's mother's house in Worsley Road, Swinton, was attacked by arsonists. The house was empty at the time, but if someone had been there, the fire could have had tragic consequences. THE NORTH WEST HAS THE WORST maintained buses and lorries in the country. This is the conclusion arrived at by Keith Waterworth, regional regulator for bus, coach and lorry road safety. An official interviewed on Northwest Tonight said he'd have no hesitation in taking action if vehicles were found to be in bad condition. The finger has been pointed at certain independent operators - no names mentioned. The Metrolink continues to be the cleanest and most efficient form of transport, though not the cheapest. Here's a young Saturday shopper running to catch the tram this afternoon. I'm experimenting with composite images at the moment, fusing one into another. It does funny things to the perspective, but the effect is interesting! A HERITAGE LOTTERY GRANT will help the Central Reference Library to digitise up to 147,000 of its images, and make them available to the public, on CD-ROM and eventually on the Internet. The grant of �,000 will enable one person to work full time on the project. Currently, you can look at 10,000 images, using two terminals set up in the Local Studies Unit, on the first floor. The pictures are fascinating, but the image quality could be better, and the interface could be improved. Still, I've spent many hours there looking at old photos - let's hope you'll be able to at home soon, whether in Moston or Melbourne. 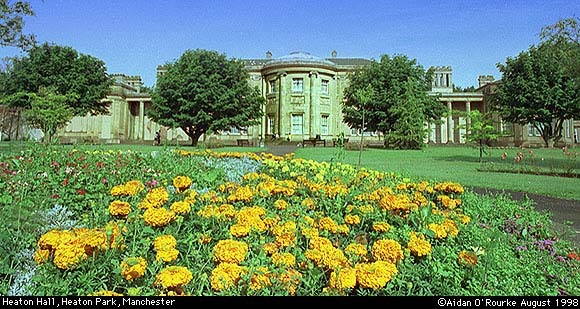 THE GOVERNMENT WILL LEND RARE ANTIQUE FURNITURE to Heaton Hall. That's the good news those restoring the interior of the Hall, designed by James Wyatt for Sir Thomas Egerton in 1772, and bought by the City of Manchester in 1902. Unfortunately it came without the furniture, causing a problem for restorers. Now, the furniture from another house designed by Wyatt, Heveningham Hall, in Suffolk, will be lent to Heaton Hall. The restoration of the Hall is part of ongoing work to improve Heaton Park, which will be used during the Commonwealth Games in 2002. WATCH OUT ON MONDAY - that's the day that Manchester will take over the baton in Kuala Lumpur to stage the next Commonwealth Games. A cat called "Kit"is Manchester's mascot. He's part lion, part cat and is reported to be Mancunian, young, vibrant, friendly, dynamic, mischievous and fun. As BBC teletext reports, Manchester 2002 marketing manager Robert Hough says he's "a bit of an alley-cat in a most endearing way". 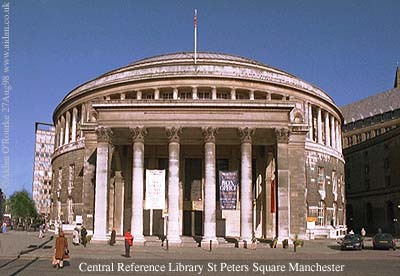 There's going to be an outdoor concert in Albert Square, with music by famous Manchester bands, including New Order. Tony Wilson will act as compere. Proceedings will start around lunchtime - I'm normally there, so I'll probably get to see it. MID SEPTEMBER has brought a breath of Summer - due to an area of high pressure over England, and southerly winds. It feels very mild and close tonight in Manchester, and the current EWM temperature at 61/16 degrees. There must be an international school of shopping centre design. Looking at your picture of the new Trafford Centre, it could easily have been taken in some of Melbourne's suburban shopping centres, even down to the palm trees! Further to your item on September 17. I attended Ducie Avenue County Secondary, (It changed its title while I was attending, from 1943-1947) It used to be Ducie Avenue Central School. It is located on Denmark Road bordered by Burleigh St. I visited the old site in 1985. It was undergoing remodelling, at that time. It was being converted into luxury apartments. Needless to say I was interested in finding out that it is presently being used for a home for the homeless. Maybe some of our old vibrations are still reverberating around its hallowed halls. The teachers were all unanimous in calling us clueless! I went on from there to be a printer. Then found my way to Canada where I became a ladies hairdresser. After this, I became a high school teacher. Then it was my turn to call the pupils clueless. I used to stand in class thinking about my old school teachers; Mr. Potash, chemistry, Mr. Cresswell, History, R.A.Taylor, the principal. Just look at his initials! I conjectured that they were all rotating rapidly in their respective graves. After your message, and the other previous one from Kay Hawley I wanted to find this hallowed place. There it was just ten minutes from where we live. Just down the street is the present day Ducie High School. Ann once temped there as a secretary. From what she told me, I'd say the present day school is a far cry from the one you went to! I hope the picture brings back pleasant memories!